Merlo introduced the ROTO in 1991. It was the world's first slewing handler, and still leads the world! Slewing adds another dimension to handler use - for handling, lifting and access platform duties - creating a truly versatile machine. Merlo's commitment to choice means there are three build levels of ROTO available, with varying features. The simpler smaller ROTO models have a 415 degree slew angle and fold-out stabilisers. ‘S’ models have Merlo’s hydropneumatic suspension system permitting travel speeds up to 40 kph. Thes models were upgraded at the end of 2006 to have the latest cab design and boom assemblies, giving them the highest full height lift capacities of their class. The top of the line 'MCSS' series adds continuous slew and the revolutionary MERlin Continuous Slew Safety system, guaranteeing stability in real-time. The huge flexibility of this digital control system allows working with partially extended stabilisers. 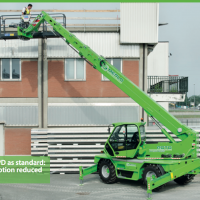 ROTO machines are particularly versatile when mated to one of Merlo’s huge range of personnel platforms, lifting equipment and other attachments!